Low exhaust flow rates make for superior efficiency! Use this Type I hood to meet the challenges of any island style cooking application. ETL Listed for use over 400°F, 600°F and 700°F cooking surface temperatures, providing flexibility in designing kitchen ventilation systems. ETL Listed to Canadian safety standards, ETL Sanitation Listed and built in accordance with NFPA 96. Sturdy stainless steel construction with double-wall, insulated front panel. Front design prohibits condensation and directs grease-laden vapors toward the exhaust filter bank. Polished stainless steel on the interior and exterior of the front enhance aesthetics. Factory pre-wired lighting to illuminate cooking surface. 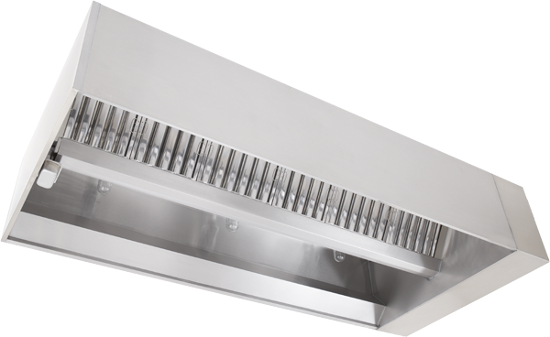 Hood comes standard with stainless steel baffle filters. Captrate Combo�, Captrate Solo�, high efficiency stainless steel baffle, aluminum baffle filters and are optional. High velocity cartridge filters are available on the T-CNDI series. Optional integral 3" air space to meet NFPA 96 requirements when the hood is against a limited combustible wall. Optional insulated 3" air space for combustible walls. Optional UL Listed light and fan control switches flush mounted and pre-wired through built-in electrical chaseway. One piece V-Bank island hood. Fabricated of Type 430 stainless steel, #3 or #4 polish, on all exposed surfaces. Optional type 304 stainless steel available. Double-wall, insulated front increases rigidity. Fitted with UL Classified, stainless steel baffle filters, removable for cleaning. Optional Captrate Combo�, Captrate Solo�, high efficiency stainless steel baffle, aluminum baffle and high velocity cartridge filters (Model T-CNDI) are available. Sloped grease drain system with removable 1/2 pint cup for easy cleaning. Pre-punched hanging angles on each end of hood. Additional set provided for hoods longer than 12'. Fitted with UL Listed, pre-wired, incandescent light fixtures and tempered glass globes to hold up to a standard 100 watt bulb. A built-in wiring chase provided for optimal positioning of electrical controls and outlets on the front face of the hood without penetrating capture area or requiring external chaseway. Optional ETL Listed exhaust fire damper (Model T-NDI-100). Model T-NDI is ETL Listed for 400°F, 600°F and 700°F cooking surfaces (File 102900319PRT-001 without exhaust damper; File 3054804-002 with exhaust damper), ETL Sanitation Listed and built in accordance with NFPA Standard 96. REMOVABLE ETL LISTED HIGH-VELOCITY CARTRIDGE FILTER: Constructed of stainless steel...uses centrifugal force to remove grease and other particulates...National Institute of Standards and Technology methodology used by an independent agency to evaluate performance...tests indicate 95 percent extraction efficiency. ENCLOSURE PANELS: Constructed of stainless steel...mounting channel factory-welded to hood for field installation of panels over 11" high...under 11", factory-welded and integrally installed into hood front and ends...sized to extend from hood top to ceiling, enclosing pipe and hanging parts. END PANELS: Should be used to maximize hood performance and eliminate the effects of cross drafts in kitchen...units constructed of stainless steel and sized according to hood width and cooking equipment. Exposed edges hemmed for safety and rigidity. EXHAUST FIRE DAMPER: ETL Listed...installed in exhaust collar...activated by a UL Listed, 212°F, 10-lb. minimum rated fusible link. ROOF TOP PACKAGE: Combination ETL Listed exhaust/supply air unit with factory prewired and mounted motors, trunkline and curb vented on exhaust side. Various models perform up to 14,000 CFM exhaust and up to 3 inches static pressure...weatherproofed...galvanized construction... washable mesh filters...exhaust/supply air fans share common roof penetration...internal wiring drops directly through curb, requiring no pitch pockets...exhaust outlets/air intakes spaced to conform to code regulations...automatic reset/thermal overload protection on all single phase motors and on three phase motors if pre-wire assembly is included in package...standard single-point power connections...UL 705, 762 Listed exhaust fans rated for high grease applications...optional backdraft dampers. SEPARATE FANS: ETL Listed single exhaust fans and supply-air fans and curbs available...same features, construction methods and performance ratings as roof top package above. HEATED MAKE-UP AIR: ETL Listed direct fired gas heated make-up air unit manufactured by ThermoTek...ETL Listed for natural gas and propane...design integrates the blower and burner into a single package... heavy duty, weather resistant, galvanized steel construction...units available in Roof Top Package or as a stand alone heated make-up air module...several models available to meet almost any performance rating specification. ThermoTek offers a FULLY INTEGRATED PACKAGE, pre-engineered for OPTIMUM PERFORMANCE. The "package" consists of the hood and options to include an integral ETL Listed utility cabinet (as pictured), containing factory pre-wired, ETL Listed electrical controls and a factory pre-piped UL Listed fire suppression system. Other options include ETL Listed exhaust damper, ETL Listed exhaust/supply air fans in a "combination" Roof Top Package or sold separately, and ETL Listed direct-fired heated make-up air units. Fire suppression systems include final hookup and inspection. The T-NDI Model has been certified by ITS. This certification mark indicates that the product has been tested to and has met the minimum requirements of a widely recognized (consensus) U.S. and Canadian products safety standard, that the manufacturing site has been audited, and that the applicant has agreed to a program of periodic factory follow-up inspections to verify continued performance. Models T-NDI are ETL Listed under file number 102900319PRT-001 and complies with UL710, ULC710 and ULC-S646 Standards. Copyright ® 2003-2014 Thermotek All Rights Reserved.